SOA Blog | Welcome to the world of SOA!!! If Schema test fails during domain creation, you need to update that particular record in the database table. 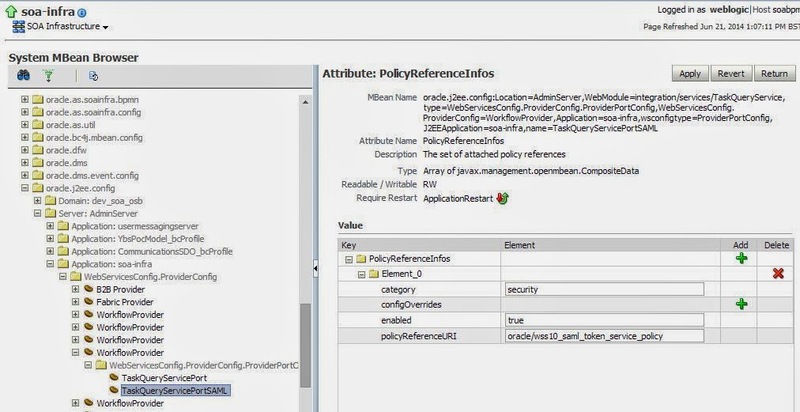 This blog explains you how to change those default policies to an OWSM policy of your choice. Change the value in the policyReferenceURI to the OWSM policy of your choice. Restart the server, and the change comes into effect. Sometimes, you may endup with the following error during deployment – the jar builds up fine, but error during deployment. [11:04:54 PM] Check server log for more details. The same project that was deploying properly suddenly stops working. This may be because one or more wsdl’s/xsd’s used in the project are changed recently or the references have updated their wsdl’s. Just refresh the bindings, update the MDS(if you are using MDS), and that solves the issue.